Is it just me or has there recently been an influx of fab fashion brands coming out of Australia!? First The Fifth came across to Asos alongside the likes of Finders Keepers, and then I was introduced to the effortlessly cool label, JAGGAR. Perhaps I'm just unobservant, but anywho, I seriously want to move to Australia right now! Clean, tailored and cool with a rock and roll edge, JAGGAR radiates that seemingly unattainable, (for me any way), "off-duty model" kinda look with a luxe twist. 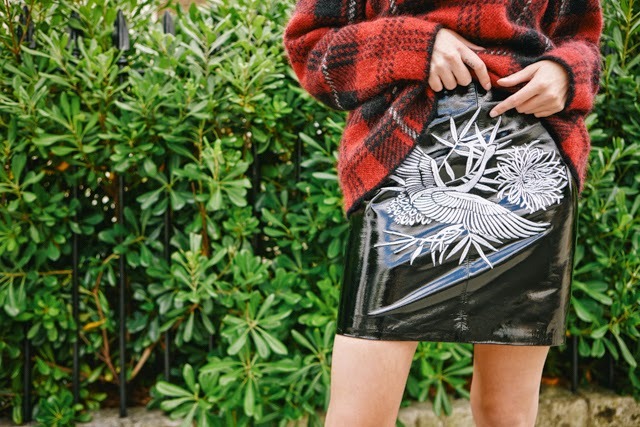 Here I'm wearing their leather Stork Embroidered Skirt. At first glance I seriously said out loud, "oh my gosh, that's mental", but then I tried it on... and now I don't want to take it off. Ever! Not only is the fit PERFECT, (I'd been looking for a well fitting leather skirt for at least a year), but it feels great and although it's a tad "out there" I'd say, in comparison to the rest of my wardrobe, I've fallen in love with it! I've also got my eye on this Daze Dress by JAGGAR too - so pretty! Do you buy these products to own such as that sweater ? Or are they sent to you ? Just wondering :) Love the jumper ! I am in love with this skirt it is so cool!